Need I fear sharks, jelly fish,etc? 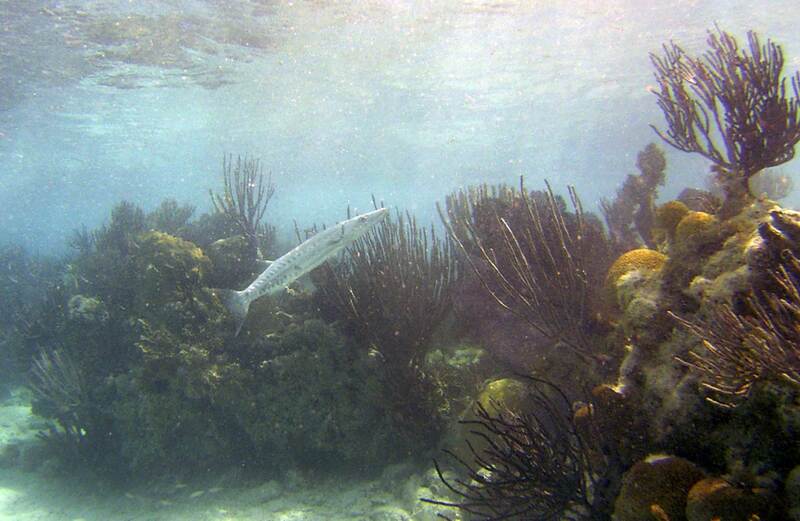 Rare sight of frightened barracuda, at our reef, in tilted, about to flee mode. Despite the media stories, sharks are not an issue. We have never even seen one during our 34 years of diving at this reef. You would have to go twice as far out, well past the reef line, and chum for a long time, to call them in from the deep. Barracuda have a weakness for shiny objects. Though not dangerous to us and great to see, most in our area have been removed by trolling lures. Portuguese man-o-war appear to be more common than they are because they get blown on the beach, for all to see. They are a danger to snorkelers stuck on the surface, with their faces down. We are underwater and they float by with their tentacles tucked in, due to the shallow reefs sticking up. I have yet to see, scorpion fish, stone fish, or lion fish at our reef. Bermuda Triangle. Come on! Get real. Besides we are merely stuck out on one corner. Bermuda does not have any sea snakes, and eels are nocturnal. Sorry Steve Irwin, no stingrays hiding in the sand. Visit these wonderful glossy creatures in Grand Cayman. Coral cuts and stinging coral injuries happen to your feet when you are swimming and do not judge the depth properly. It can also happen to free floating snorkelers and scuba divers, especially where the surge of swells pushes you into reefs. Helmet divers are standing firmly on the bottom. Bring socks if you are squeamish. We have small crabs hiding in the reef. Our environment is not suitable for the blue crabs that hide under the sand, pinching people wading in the shallows. Fish Bites. I have been bitten because I have the food. Each friend competes, and thinks the party is just for them. Though snappers and groupers are carnivores, they must swallow their food whole. Therefore, we are off the menu. If I want a laugh, I’ll hand you the food and tell you to take out a piece… Don’t. Shoes are not necessary as the bottom is sandy. We are not on the coast; there is no broken glass. If you wear shoes you will scuffle the sand and reduce visibility, because you can’t feel the bottom. If you are diabetic, wear socks.